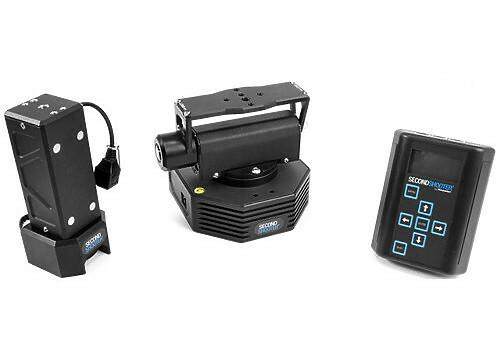 The 3-axis Second Shooter Bundle from Kessler Crane is a motion control system that lets you create dynamic and repeatable movements with your Kessler slider. Compact in size and intuitive to operate, the Second Shooter system makes it easy to capture repeatable motion control for live-action, time-lapse, or stop-motion applications. Compared to stepper motor systems, Second Shooter receives feedback communication from digitally encoded motors when determining motor positions to ensure precise control. The system is quick to set up in the field, making is suitable for run-and-gun and one-man-band shooters as well as larger production houses. Note: A Kessler slider is required to use this system, we use this unit with the 3ft and 5ft Kessler cinesliders. Included in the bundle are the key components required to construct a 3-axis system: the Second Shooter Controller, Slider Motor, quick release plates and Pan & Tilt Head.